The 2016 Shortlist: all the little rebels have come out to play!! We are proud to announce the Little Rebels Shortlist for 2016! We have 6 books on the shortlist this year. All stood out as literary rebels on the children’s literature scene for books published in 2015. Full details of the books are published below. As always all can be bought from the award administrators, Letterbox Library, a specialist children’s booksellers who are also a not-for-profit and a workers cooperative. (And, during #littlerebels season -April to June- the shortlisted books are also listed at a special price). The Little Rebels judges are meeting this month and the winner will be announced at the London Radical Bookfair on May 7th 2016 at the Alliance of Radical Booksellers’ new fair venue, Goldsmiths University. You can keep on top of the fair at @ARBRadBookfair The event is FREE and open to all. Please join us! This award is run voluntarily and unfunded by Letterbox Library on behalf of the Alliance of Radical Booksellers (ARB). To keep this award (and the sister, adult, award Bread & Roses) running, we do ask you to buy from Letterbox Library or from other ARB members wherever possible. Thank you. It’s a hat trick for John Boyne- this is his 3rd time on the Little Rebels shortlist, following on from the shortlistings of The Terrible Thing That Happened to Barnaby Brocket in 2013 and Stay Where You Are and Then Leave in 2014. In his latest exploration of the cruelties of war, Boyne introduces a boy called Pierrot, orphaned at a young age, who ends up in Hitler’s Austrian house in the mountains, the Berghof. Pierrot starts out as a kind, sensitive child who loathes bullying and shares a magical friendship with a Jewish boy, Anshel (who is also deaf). But then gradually, over the years at Berghof we see Pierrot become Pieter, slowly but surely infected by Nazi ideology, prejudice, and racism- and by the trappings of power. A study of corruption and atonement. Ages 11+ Buy your copy here. Gill Lewis was named winner of the Little Rebels Award in 2015 for Scarlet Ibis and this is now the 3rd time Gill Lewis has been shortlisted (see also Moon Bear)! This is classic Lewis- the interweaving of separate animal and human stories to expose issues around social justice. Set in the Democratic Republic of Congo, this story explores how the farming of a mineral needed for mobile phones is destroying the gorilla’s natural habitat. Linked to this is the story of two children, Imara and Bob, who are held by a group of rebel soldiers. Fundamentally a story about exploitation (by both rebel soldiers and Western companies)- of children, of animals- for profit. Ages 11+ Buy your copy here. An energetic picture book which takes on gender stereotypes and smashes them to smithereens. Meet a girl who is competitive, noisy, brainy, speedy, messy and, who is consequently… repeatedly mistaken for a boy. Puts paid to all of those tiresome ‘boys are…’ ‘girls are…’ opening lines. Age 4-7 Buy your copy here. The finches exist as an undifferentiated flock, going through each day together, doing the same thing, at the same pace. And then…one night, one particular finch, Henry Finch, has a thought. And he hears it. And he knows himself to be Henry Finch. And, therefore, also capable of greatness… A highly original philosophical book for the very young, addressing individualism, bravery, finding your way and, even, existentialism. Age 6-11 Buy your copy here. Superhero Origami Girl is back and this time she is on a mission to save a local bookshop. Foreman delivers us all of the defining ingredients of a ‘radical’ children’s book; this could have been written for the Little Rebels Award with its themes of: capitalism threatening a local community and independent businesses, the complacency of governments in the face of large corporations, the possibilities of people power and local community action. Age 4-7 Buy your copy here. As the back cover reads, “A completely bonkers book that is not linked to Gobb Education at all”. Malcolm is a sensible 10-year-old full of sensible questions. Which leads to one or two clashes with Uncle Gobb, Uncle Gobb’s world views and his dreaded shed. Two artists known for their comic touch combine forces to deliver an anarchic story which exposes and shames, hilariously, many aspects of contemporary culture but, in particular, recent educational policies. All done so in a way which nods knowingly to both adults and children. Age 7-10 Buy your copy here. Entries for feistiest children’s book award now closed! 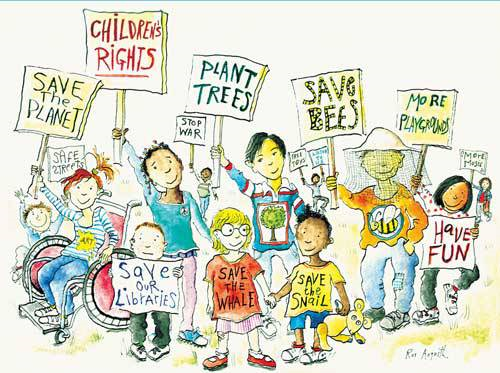 Join Us on May 7th for a Radical Children’s Book Fest! The Little Rebels Award recognises children’s fiction (for readers aged 0-12) which promotes social justice or social equality, challenges stereotypes or is informed by anti-discriminatory concerns. The award is given by the Alliance of Radical Booksellers. Click here to receive notifications of new posts by email. The 2019 Little Rebels Award shortlist is here! Submissions for the 2019 award are closed.